Good Morning to all from chilly Kansas City! 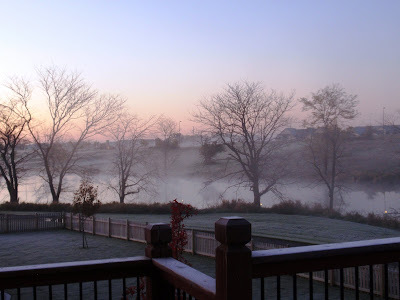 I was up early this morning doing some cleaning when I looked outside and noticed the frost and steam rising from the pond. It was beautiful so I snapped some quick pics. Sorry there a little shaky/blurry it was COLD outside!!! I am not sure whether or not this was the first frost for us this Fall, but it is the first one I have been up early enough to witness. I thought I would share my pics with you. Hope you are all enjoying some beautiful Fall weather as well.